This product should always be used prior to applying a treatment or a shampoo. This formula uses botanical oils that facilitate detangling while nourishing the hair. 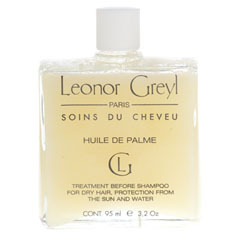 Apply Huile de Palme evenly to dry lengths and ends, brush hair to ensure even distribution. The oil should be left on for up to 10 minutes or all night if desired and then use the shampoo suitable for your hair type. Huile de Palme provides necessary hair protection against the damaging effects of sun, seawater and chlorinated pool water. Apply as previously described and reapply after three or four immersions in water. The perfect blend to protect and restore damaged lengths and ends.